Tarot for Change: Online readings, mobile apps or paper cards? Online readings, mobile apps or paper cards? Tarot readers seem to be divided into two camps or schools: the ones who are happy with electronic versions of cards (online or on mobile) and the ones who want to physically touch the cards, shuffle them, lay them out, feel the texture, have a tangible element in the reading. Toth deck cards, photo: Kyknoord, under Creative Commons licence. At the beginning of my tarot journey I was apprehensive towards online readings because so many of the websites offering free readings have a tacky, New-Age-clichéy appearance. It somehow smells like a scam miles away, even if it weren't! However, the cards don't seem to mind in what settings they are. I've received surprisingly accurate readings on platforms I didn't otherwise like; and the same cards repeated across different websites I tried, if I asked about the same matter. However, because of this initial distrust towards online cards I purchased my first paper deck, the Pamela Colman Smith centennial edition package (Rider Waite Smith) and this deck proved to be great for learning purposes. The somewhat archaic and simplistic illustrations are, in fact, fascinatingly deep and packed full of meaning and symbolism, beginning from the facial expressions of the characters. This year I've moved away from the RWS because I discovered the world of mobile apps, as flaunted before. I think it's important for the reader to be somewhat calm, focused and clear when doing a reading - to avoid the answer being a mudslide of unrelated info -, but I personally have never required any sort of meditation, rituals, dim mood lighting, candles, whatnot to do a reading. Meaning that I seem to be able to get reliable answers on the go, no need to be securely at home with a paper deck (which was too big to carry around). 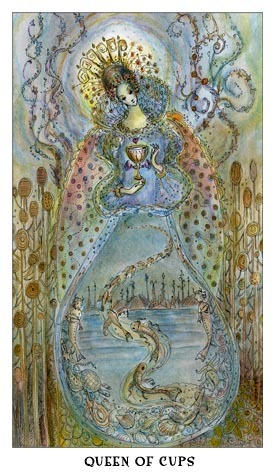 The beautiful Queen of Cups from Paulina Tarot (c) Paulina Cassidy, published here under permission. If pre-meditation, candles, rituals etcetera work for you, cool, stick with them, but tarot doesn't seem to be too fuzzy about when and where it's read. The answers depend on the nature of the deck, the question and how well the question was formulated for a comprehensible answer. My new tarot love is the Fool's Dog Tarot Sampler app,* which is free to install and it offers a great selection of spreads to practice with, including a free form spread. The Sampler does require a shift in thinking: it literally whisks cards across a number of decks into the same spread. This at first felt confusing and even annoying, because a user can't pick and choose which deck to use. You might end up getting cards you don't particularly like or connect well with. However, after using these apps for a few months now (there are Tarot Samplers II, III and IV available in Google store) I'm utterly surprised by their accuracy. 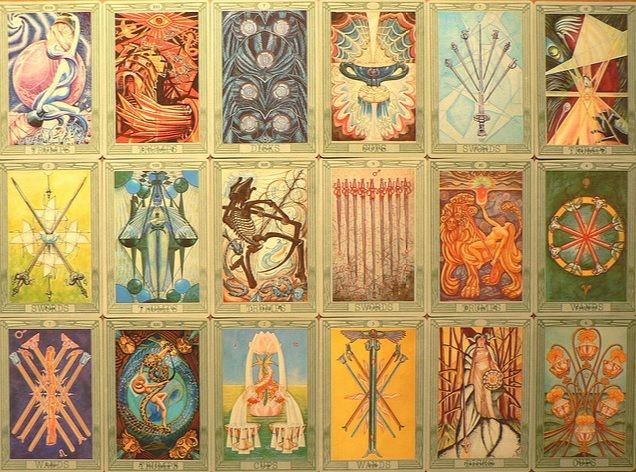 For a fluent or intuitive reader the Sampler gives much more information than one particular deck usually can, because it combines the strengths of a number of decks and imagery. I also like the surprise element of this tool because you never know - even less than you'd know with one deck - what will come up and how the answer wants to be interpreted. Keeps you on your toes! * I am not affiliated with Fool's Dog, I simply love this product because it works well for me. Tarot and science - access to another dimension? Tarot 101 - how to start reading? Tarot and reconciling with an ex? Do you need to be a psychic to learn tarot?